Plot a course to 5 Degrees West! Its going to be great to be back in Falmouth! 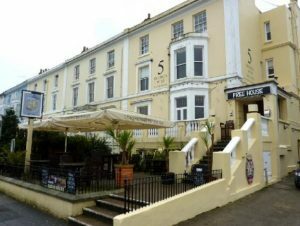 We’ve had some amazing gigs here with the Falmouth Cider & Folk Festival and appearing with The Wurzels at Falmouth Week and of course the last two years performing at the Falmouth International Sea Shanty Festival. We had a particularly good gig in the garden at the back of 5 Degrees West so we’re expecting great things when we kick off on the bar this January with some new songs for 2019.